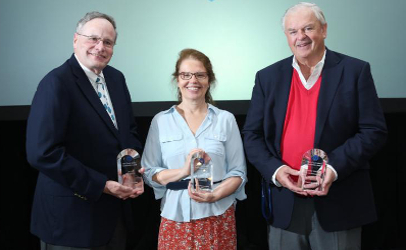 The 2017 NSF Food Safety Leadership Achievement Awards were presented to, from left, Jack Guzewick, trainer/consultant; Lee-Ann Jaykus, researcher at North Carolina State University; and David Theno of Gray Dog Partners. ANN ARBOR, MI – NSF International, a global public health and safety organization that provides food safety and quality assurance services across all food supply chain sectors, announced the recipients of the 2017 NSF Food Safety Leadership Awards at the 2017 Food Safety Summit outside of Chicago this past week. NSF International’s Food Safety Leadership Awards recognize individuals and organizations for real and lasting improvements in food safety. Created in 2004, the awards encourage the development of educational programs, processes and technologies to advance food safety. Each year, an independent panel of food safety experts from academia, industry and the regulatory community reviews nominations from around the world to select the recipients. Nominations are evaluated on the basis of innovation, impact and contribution to the advancement of food safety. “These awards honor the recipients for their contributions to food safety and the protection of public health. The work of Jack Guzewich, David Theno and Lee-Ann Jaykus has contributed to important advances in food safety research, industry innovation and pathogen mitigation. Their leadership and enthusiasm in science-based research, collaboration and information sharing to help solve vital food safety issues embodies the spirit of NSF International’s Food Safety Leadership Awards,” said Kevan P. Lawlor, NSF International president and CEO. Lee-Ann Jaykus, Ph.D., is the William Neal Reynolds Distinguished Professor of Food Science at North Carolina State University. She has over 30 years’ experience advancing the science of food safety through applied infection prevention and control science, especially regarding norovirus. She has collaborated on many large, multi-institutional projects on foodborne pathogens and food virology, including developing methods to detect human enteric virus contamination in foods and environmental samples, and better understanding the dynamics of virus transmission through the food chain. She serves as the Scientific Director of the USDA-NIFA Food Virology Collaborative (NoroCORE), a team of 30-plus scientists representing 18 academic and government institutions working to develop improved tools, skills and capacity to understand and control foodborne virus disease risks. Under Dr. Jaykus’ direction, NoroCORE has worked closely with companies, trade organizations, government regulators and public health entities to identify and address the most important food virology problems, and translate results into real-world processes and actions. These include cultivating human norovirus which had eluded scientists for 50 years, developing a risk-modeling program for tracking norovirus that can calculate disease risk and screen strategies for managing contamination in food service and health care facilities, confirming that alcohol-based hand sanitizers cannot completely inactivate norovirus and working to modify FDA Food Code recommendations to facilitate norovirus control. In her academic career, Dr. Jaykus has taught graduate and undergraduate courses in food microbiology and safety, mentored over 30 graduate students and post-doctoral research associates, and authored over 150 publications. “I have never met a scientist or food safety professional as enthusiastic and competent as Dr. Jaykus is in defining the issues, developing key needs, initiating the means to fill gaps and translating findings quickly into industry applications,” says Hal King, Ph.D., President/CEO of Public Health Innovations LLC. Throughout his 40-year career, David M. Theno’s work set new standards for food safety leadership and management in food production and in the foodservice industry. He has been instrumental in demonstrating how the scientific community and the meat/food industry can work together to solve food safety challenges. He has a Ph.D. and is CEO/CBIO of Gray Dog Partners Inc.
Dr. Theno installed the first Hazard Analysis and Critical Control Point (HACCP) program in an animal protein production plant while at Foster Farms in the mid-1980s. His work in the early 1990s at Jack in the Box is widely credited with setting new standards for food safety leadership and management in all aspects of food production. After an Escherichia coli (E. coli) 0157:H7 infection of the chain’s burgers caused a foodborne illness outbreak in the Pacific Northwest, he developed the first comprehensive food safety management plan for a foodservice chain. He also implemented a finished ground beef testing protocol, a comprehensive supply chain auditing system and a “test and hold” protocol for ground beef that is now an industry standard. This management program resulted in a significant reduction of foodborne illness outbreaks in the foodservice industry, and all major foodservice chain organizations today have implemented a food safety management plan based on this program. Serving as a member of the USDA’s National Advisory Committee on Microbiological Criteria for Foods, Dr. Theno was instrumental in changing the way the USDA and the industry look at food safety. He played an essential role in helping guide the beef industry’s research activities to better understand E. coli O157, and helped form the Beef Industry Food Safety Council, which develops and updates food safety practices that are critical for the food industry. Dr. Theno is one of the original authors of the HACCP guidance issued by FDA and USDA/FSIS that is in place today, and has authored numerous scientific and trade publication articles. “David Theno’s leadership through the E. coli outbreaks in the 1990s set the stage for the entire industry to come together in a non-competitive, collaborative effort to employ science-based solutions to tackle emerging pathogenic threats,” says Thomas H. Powell, Ph.D., CAE, Executive Director, American Meat Science Association. Over his 46-year career, Jack J. Guzewich, MPH and consultant and trainer in foodborne disease epidemiology and food emergency response, has been a national leader in food safety regulation and the epidemiology of foodborne disease. He is a proponent of environmental assessment including root cause analysis to investigate the causes of foodborne disease outbreaks and food contamination events. Much of his career was spent on investigations to understand how food becomes contaminated with foodborne pathogens and the ecology of pathogens in various environments. Guzewich directed the New York State Department of Health’s food safety program for 17 years and created the Foodborne Disease Surveillance System (FBDS), an extensive database of reported foodborne disease outbreaks including their contributing factors. FBDS was one of the first systems of its kind and served as a precursor to today’s National Outbreak Reporting System. Guzewich guided the adoption of New York’s regulation to prohibit bare-hand contact with ready-to-eat foods and worked to include these provisions in the FDA Food Code. He was instrumental in documenting gastroenteritis and Salmonella enteritidis outbreaks associated with shellfish and shelled eggs, respectively, by identifying trends and developing interventions to prevent future outbreaks. As a result, control recommendations implemented by New York under his leadership led to national improvements as provided in the 2009 Egg Safety Final Rule. At the FDA’s Center for Food Safety and Applied Nutrition, Guzewich created and led the Center’s Emergency Coordination and Response program with a strong emphasis on prevention and control of foodborne disease. He developed the FDA procedures for investigating produce farms implicated in outbreaks or contamination events to identify the root causes of contamination, which required an environmental assessment versus a routine inspection. He worked very closely with the CDC’s Environmental Health Specialist Network to help develop the National Environmental Assessment Reporting System which is used by several states to help identify the root causes of foodborne disease outbreaks. He was also instrumental in developing the publication Procedures to Investigate Foodborne Illness and contributed to the first editions of Guidelines for Foodborne Disease Outbreak Response and Guidelines for Foodborne Disease Outbreak Response – Toolkit. “Jack Guzewich is the epitome of a food safety leader,” says Dale L. Morse, MD, Associate Director for Food Safety, Division of Foodborne, Waterborne and Environmental Diseases, CDC.